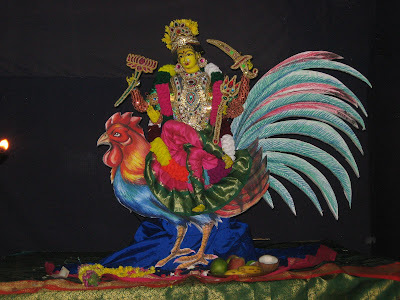 The Subramania Samaj Temple in Chedda Nagar, where I live, is a temple dedicated to Lord Muruga or Subramanya. However, the temple also houses other deities such as Ganesha, Krishna, Ayyappan, Shiva, Durga and Hanuman. 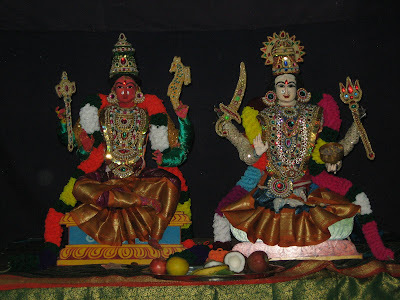 The temple thus celebrates a wide range of festivals, among them, Navaratri, dedicated to the Devi. For the nine days and nights of the festival, the temple resounds to the sounds of Sanskrit Slokas - from the readings of the Devi Mahatmyam in the mornings to the chantings during the Chandi Homam in the evenings. For those of us who live in the vicinty, the sound is almost like a background music, one we notice only when it stops! However,the highlight at the temple (at least for me and Samhith!) is the decoration made every evening for the homam, depicting one form of the Goddess. For each of the nine days, we get to see a new arrangement, one we eagerly rush to see. This is the only part of the temple where photography is allowed, and it is now quite common to see young boys and girls with their digicams eagerly taking photos, asking about the Devi depicted! The name of the Devi is conveniently mentioned on a board for us ignoramuses, so it just makes things easier. As to the explanations, if the priest happens to be busy, it does not really matter, for the net is an inexhaustible source of information! The one on the left is Jagat Prasootika, the divine mother of the Universe. The image shows the universe as a child in the arms of the mother,and signifies the divine mother nurturing the universe as her child. The one on the right is Lalitha Tripurasundari, the one who is the most beautiful in all the three worlds! The second day brought us a new form of the Goddess, one we hadn't even heard of before - Bahuchara Mata. 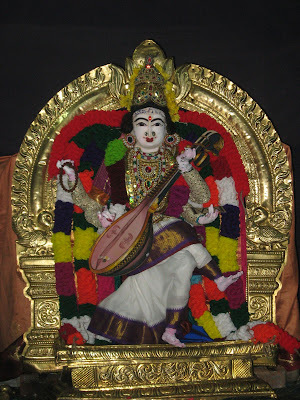 Bahuchara Mata is a Hindu goddess. She was a daughter of a charan Bapal dan Detha. She and her sister were on journey with a caravan when a marauder named Bapiya attacked their caravan. It was common practice in charan men and women if overpowered by their enemies, not to surrender but to kill themselves. Shedding the blood of charan was considered heinous sin. When Bapiya attacked the caravan, Bahuchara and her sisters announced tragu and cut their breasts. Legends tells that Bapiya was cursed and became impotent. The curse was lifted only when he worshiped Bahuchara Mata by dressing and acting like woman. Today Bahuchara mata is considered patroness of—and worshipped by—the hijra community in India. Her followers believe in non-violence and consider killing of all animals and creatures a sin. The goddess is shown seated on a rooster, holding in her arms, a sword, trident and lotus. Her fourth hand is shown blessing her devotees. There are temples dedicated to this form of the goddess in Gujarat as well as Rajasthan. The most famous among these temples, located in Mehasana, Gujarat, even has its own website, with lots of pictures and stories about the goddess. Click here to visit the temple website. Maheshwari (pronounced Maaheshwari) is the female counterpart of Lord Shiva (Maheshwara) and is thus shown with the same weapons as the Lord. 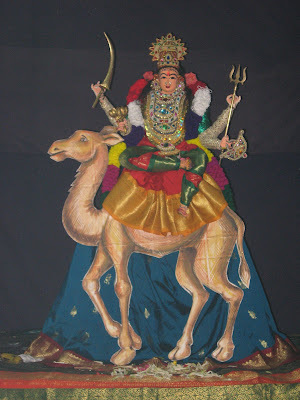 This arrangement shows her with an axe and an antelope in her two upper hands, while among the lower ones, one is shown by her side, while the other is shown blessing her devotees. Santoshi Mata needs no introduction. She is probably the most popular among all the goddesses depicted! For those of you who would like to read more about her, click here. Kaalaratri is the seventh goddess among the Nava Durgas - the nine forms of Goddess Durga, as mentioned in the Devi Mahatmyam. Her name literally means 'dark night', or the complete blackness of night, but she also depicts the destruction or victory over time (kaal) itself. She is dark,with unruly hair, wearing a necklace of lightning, holding weapons in her hands, and blessing her devotees by ridding them of fear. She is shown riding a donkey. The fifth day showed a bit of change, with the depiction of Kubera Lakshmi, which I have already written about here. Momai mata is a corruption of the word 'Mahamaya'. She is the kuldevi (family deity) of many Rajput clans, and she is known by various names in different areas of Rajasthan. She has, as her vehicle, the camel,not surprising, since she is a deity of the desert! One of the stories tells of a king who disrespected the devi since she was worshipped by the poorer sections of society, and had to bear the brunt of her anger. He finally had to atone by performing special pujas and vrats (fasts) to her, and she thenceforth became his family deity. To read more about her, click here. 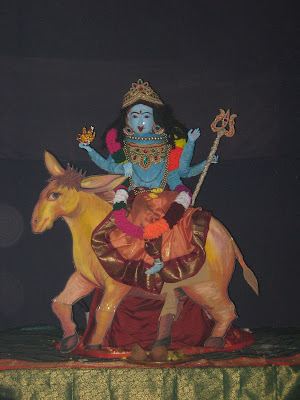 The seventh day's arrangement depicted the Devi as Shakambari. 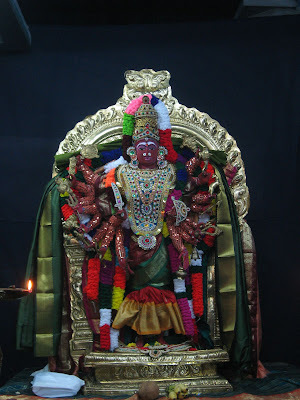 In the Devi Mahatmyam, Durga prophesies that when the earth has been dry for a hundred years, the wise ones who continuously meditate upon her will cause her to be born in a superhuman fashion and she will bring forth from her body; fruits, flowers, vegetables and herbs to take away our hunger and thirst and our fear of death. She calls herself Shakambari. We pray to her for abundance of fruits and vegetables. 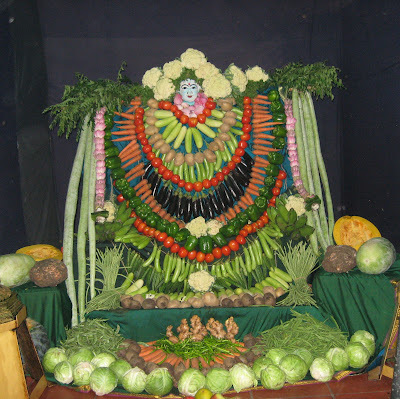 She is depicted as being covered with fruits and vegetables, and as you can see from the photograph, apart from the face, every inch of the Devi is made up of vegetables, including the decoration around her. For more photos of Shakambari, see my earlier post. The Eighth day or Ashtami is also called Durgashtami, so it was no surprise to see Kanaka Durga, but with one small difference. Kanaka Durga, located at Vijayawada, has only eight arms, while the figure depicted here has eighteen. In fact, the board mentioned her as 'Ashta Dashabhaya Kanaka Durga' or Kanaka Durga with 18 arms! Any explanations, anyone? The ninth and final day is dedicated to Saraswati, so no surprises again - the decoration was the Goddess of Learning herself! Ten goddesses in nine days (11 if you count Kubera Lakshmi). That includes two goddesses we had never heard of! This is the main attraction the temple holds for us during this festival season... There is so much we get to see, and get to hear.. and of course, so much I get to write about!! EC has some wonderful pics of the Golu at Triplicane Sri Parthasarathy Temple,Chennai on the blog Temples of India. Richard regularly posts about the events and festivities at Thiruvannamalai, and he has posted some wonderful pics of the Golu at the Yogi Ramsuratkumar ashram. wow! 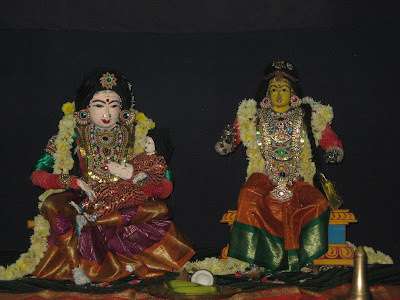 We generally have decoration of Ambal in the SIES Temple of Nerul also. But since I amd working and I also keep golu, I am never lucky enough to see the alangarams. Thats pretty comprehensive Anu... Nice to read about her different forms at a single place..
And the pics are fabulous! !